This day brought with it every kind of weather: sunshine, fog, wind and torrential rain! It was beautiful, dramatic and unlike any other day! This secret venue only hosts a handful of weddings each year. It's located just off the coast between Santa Cruz and San Francisco, so it is quite a gem. We absolutely loved filming there! The fairy circle of redwoods, the house surrounded by a little lake and the fern filled forest were adored by guests. When our host drove us to the top of the mountain on a four wheel drive only dirt road, we were gobsmacked by the spectacular sweeping views and dramatic fog rolling in around us. Leyla and Matthew couldn't wait to get married and celebrate surrounded by their supportive friends and family. They were really excited to be able to look back and see the two of them, their love, and the beautiful outdoor setting all come together on film. They loved the unique setting and their planner, from Coastside Couture, did a fantastic job of using all the space to let people spread out and enjoy themselves. Leyla and Matthew had two ceremonies, one in the redwood fairy circle and a traditional Persian ceremony. These were followed by a lovely cocktail hour and a big beautiful dinner under white canopies to protect everyone from the rain that came pouring down in the evening. I initially put off watching our film for a bit since it’s always scary to see myself on film, but when we did we absolutely loved it. I was totally blown away by how lovely it was and how great it made us feel to be able to relive the day. We can’t thank you enough, I’m so happy we decided to have video. We’ve probably shown it to our family a million times. We truly had an exceptional team of vendors. Leyla and Mathew's wedding was a whirlwind. It was packed to the gills with things we wanted to capture and rather extreme weather conditions that everyone had to adapt to. With this team the day flowed seamlessly. Coastside Couture did an outstanding job bringing all the details together and making sure people were warm and dry, and that everyone was happy all day and night. The florals by Seascape Flowers were beautiful, as usual, and they stood up in the rain! We worked alongside Bethany Carlson, their photographer, all day. She was super fun and her photos turned out stunning! To see her photos check out her website where you can find this wedding and more of her exceptional work. 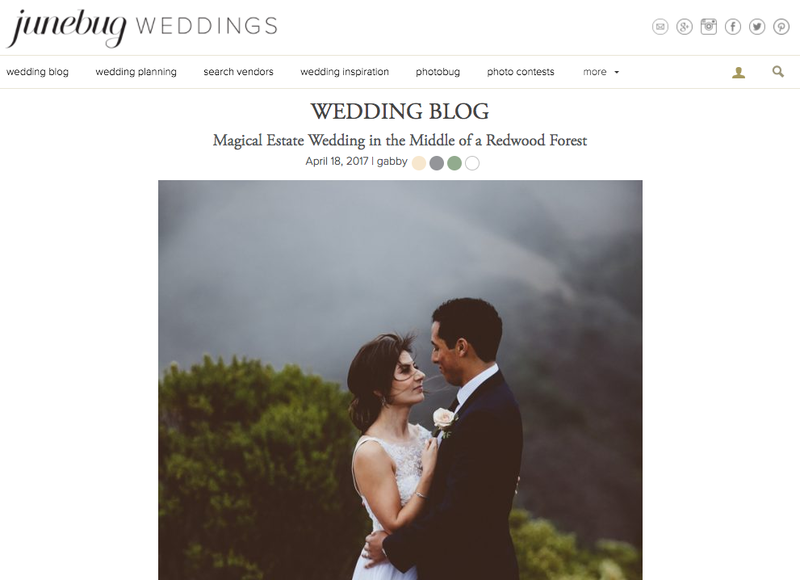 You can also visit the publication of Leyla and Mathew's wedding on Junebug Weddings! And you can find the rest of this wonderful vendor team below. It's a rare and special treat for us to get behind-the-scenes pictures, so we can't help but share these beautiful photos from Bethany Carlson! We can't thank her enough for capturing these moments for us! They really bring back all of the fun we had that day and remind me of just how crazy the wind was on the top of that mountain. It was almost as incredible as the panoramic views!